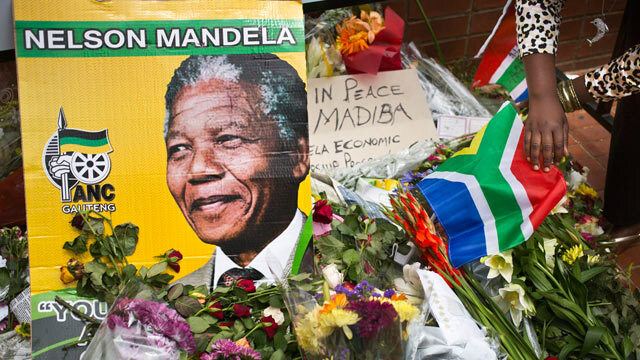 He came a long way, but Nelson Mandela's career began as a revolutionary. Prison made him a statesman. There was another side to "Saint Nelson", says a South African journalist. PRETORIA - When I got up Friday morning and heard the news that Nelson Rolihlahla Mandela, South Africa’s first black president, had passed way, I was surprised at my own reaction, which was quite mixed. The first thing I felt was, surprisingly, resentment. I had, since Madiba’s release from jail and subsequent presidency, retirement, “retirement from retirement”, and his later years, come to form a very positive picture of him. And yet, here I was listening to South African Broadcasting Corporation (SABC) radio, then switching the TV from SABC to eNCA (a private network) to BBC, CNN and the rest and I felt a strong sense of resentment. I wondered why. After some introspection, I realised. These media were eulogising Mandela. He was a saint. He lived for others; he forgave those who unjustly imprisoned him; he fought a brutal regime with peaceful words; he inspired South Africans to unite; he became an icon to the world and so on. A left-wing Portuguese newspaper compared him to Jesus Christ. Which is all very well. But it is not the whole story. It is like a eulogy at a funeral. You only say nice things about the deceased. So far, so good. But these are supposed to be news stations. A more balanced view is needed. First, Nelson Mandela is someone who is indeed to be admired in that from early on in his rather privileged life, he decided to live and work for the upliftment of his people. He was indeed privileged. His clan is that of Madiba, which has provided many kings for his abaThembu (Thembu People). While these people, because of their language are called “Xhosas”, the Thembu people were an independent people until fairly recently. Mandela went to private schools and attended Fort Hare, which was the only university for blacks in the country at the time. Privileged indeed. So that’s part of my resentment. My parents were refugees. No privileges, no old school ties for refugee kids and certainly no royal or other fancy pedigree. But OK, back to Mandela: He later increased his activism to all people in South Africa who didn’t have the vote. So that’s admirable. But he came to a point – understandably – where he decided to create a Communist revolutionary movement, to overthrow the system by violence. This horrified the Nobel Peace Prize winner and leader of the African National Congress (ANC), Chief Albert Luthuli. He later, reluctantly, gave a qualified blessing to the “class struggle” (changed to be more palatable to Western supporters into “Freedom Struggle”). Luthuli was first and always a Christian and therefore understandably not enthusiastic about founding a Marxist guerrilla organisation. Later, he gave his qualified blessing to it, but he was never comfortable about it. A note needs to be inserted here about African culture. In traditional African culture, something Nelson Mandela was very much tied into, there is a complex system of interlocking obligations that go with membership of a clan or extended family. These include marriage ties but also spirituality and social organisation. Chief Luthuli, as a Christian, would put himself outside these ties, while Mandela, who never became one, remained in the “system”. This gave him the type of clout he would not otherwise have had. In contrast to Luthuli, Mandela felt violence was very necessary. He felt all other avenues of dealing with the Apartheid government had been exhausted, so he created Umkhonto we Sizwe (Spear of the Nation) a Communist guerrilla organisation. It is not true, therefore, that Mandela was a pacifist or a peaceful resistor against Apartheid. He was all in favour of armed revolution. The question is, what was the purpose of this revolution? Was it democracy? I doubt it. You see, I was here in the 1970s and the 1980s. I had a lot of sympathy for black people under Apartheid and would have been an activist had they not turned to the allies they did. But their words at the time (which they deny now) were straightforward Communist terminology. They never quoted people like Edmund Burke, Jean Jacques Rousseau or Thomas Jefferson. They only quoted Marx, Lenin, Mao and the other professional killers. Some of them still do. So how could I join a movement that was openly promising to bring the same murderous system that massacred my people and refused to allow political freedom; freedom of speech; of conscience? But there is more. Mandela founded Umkhonto, known as “MK”, for short. But what did this MK do? Compare the Dalai Lama and the Tibetan people’s struggle against a regime much more brutal than the apartheid one. The Tibetans only fought until the Dalai Lama fled in 1957. Since then, they have used peaceful means. Mandela and MK turned the other way. They joined in the Cold War on the side of the USSR, Communist China and the rest. Now this isn’t as bad as it sounds. The old adage: “My enemy’s enemy is my friend” was true in that period, too. During the end of the Colonial Era, part of which coincided with the Cold War, many otherwise decent people were prepared to countenance the crimes of Communism in order to more successfully oppose Britain, France or Belgium in their struggles for independence. One example would be India’s leader, Jawaharlal Nehru, who was very quiet about the Soviet Union’s crushing of Hungarian Independence in 1956. Mandela’s ANC was as bad, glorying in the crushing of what they considered to be “counter-revolutionary” elements. The ANC and South African Communist Party (SACP) actually called on the USSR to crush the pro-democracy movement in Czechoslovakia called the “Prague Spring” in 1968. How could these people then call themselves democrats? In other words, those who fought for their basic human rights, multi-party democracy and freedom of speech, if they fought the USSR, should indeed be shot! This is not the behaviour of a humanitarian! This man and his organisation were not in the same league as Mahatma Gandhi or the Dalai Lama! But then Mandela was arrested and found guilty not of wanting democracy and freedom, but of trying to overthrow the government. No doubt he had good reason to want to. But look at the recent “Boeremag” trial. (“Boeremag” means “Boer Force”.) They got up to 48 years in prison! No government, democratic or otherwise, is going to tolerate people overthrowing it by force. And, this is where my resentment comes in. Victims of the Communism that Mandela et al were fighting for and whose plentiful assistance they had, did not get the perks he got. Most of those sentenced to Soviet Gulags were not given a trial; never had a defence lawyer and got no publicity. Anatoly Marchenko, who wrote My Testimony, was imprisoned in different prison camps from 1958 to 1986, when he died of a simple infection. Unlike Mandela, he did not have highly qualified doctors to treat him, he was not visited by the International Committee of the Red Cross (ICRC) and no one in the West or Third World protested at his unjust imprisonment. None of the members of my family who were deported and who either died or returned as shells of themselves, unable to ever work again, was ever charged, none was ever tried but they suffered anyway. That, in my opinion, is worse than planning the overthrow of a government – even an evil one – and then being sent to prison under international supervision. Things should be kept in perspective. They were both human beings. Why do we care about one and ignore the other? It is a question for each of us. So, Nelson Mandela spent 18 years on Robben Island. Then he was transferred to much more comfortable conditions in Polsmoor Prison and then to what amounted to house arrest at Victor Verster Prison. He was diagnosed with TB. In the glorious Communist world (such as China’s Lao Gai) he would have died. In South Africa he was sent to a hospital. And those of us who experienced Communism should not feel anger? A sense of injustice? A feeling that there are double standards here? But what did MK do in this time? This creation of Nelson Mandela -- did it attack legitimate military targets? Actually, yes. At first, MK went after military and police targets. But there campaign did not get very far. So they turned to what they called “soft targets”. In short, they stooped to terrorism. Note, Gandhi never blew up any children, but MK did. I should know. I was a copy editor on the Benoni City Times when MK blew up a local eatery, similar to a MacDonald’s, called the Wimpy Bar. It was the first restaurant that opened its doors to all races. And then MK bombed it. I stopped for a cup of coffee. I thought maybe I should have a burger, but then decided to go home. Had I stayed, I might have died or been injured. All this came out during the Truth and Reconciliation Commission. So they very nearly got me. Despite our family fleeing thousands of miles to be away from Communism, it followed us. And when Nelson Mandela was released, did this “saint” condemn or criticise any of these actions? No. And did he ever criticise his allies and “comrades” practice of “necklacing”? This consisted of getting a car tyre, filling it with petrol (gasoline) putting it over the head of a terrified victim and lighting it. How can this be compared to the actions of Gandhi or Martin Luther King? Did Dr King’s followers murder “collaborators” like this? At least 400 people – almost all of them innocent – died in this horrific way. And let us not forget that MK adopted the above-mentioned Communist practices of torture and murder, like those employed by the Soviet KGB or the Chinese Lao Gai. In their camps for suspected traitors to their cause, they tortured and murdered their own members. These camps were referred to as Quatro, as the TRC reported. So did “Saint Nelson” criticise this horror? No. Not once. So if I say I don’t want to hear about his saintliness, that’s why. But what about after his release? I never met him personally, but was in the same room as him at the CODESA (Congress for a Democratic South Africa) as a reporter for Audio News, part of SABC Radio. He was a tough negotiator, a hard man and clearly a strong one. I would not have liked him to be my enemy. But he earned my respect then. So all I can think of is that prison was the best thing that ever happened to Nelson Mandela. In prison, unlike victims of Communist prisons (and many other tyrannical regimes) he could write letters, he could receive letters, he could get newspapers and follow world events. And somewhere, something changed. When he was released in 1990, although he still publicly espoused all the standard Communist demands: nationalisation of mines and all land and so on, he was now prepared to listen. During CODESA (1990-1994) he was able to imbibe much that had changed in the world. And his Communist comrades were now discredited. Communism had collapsed in the former Soviet Bloc and people were beginning to see the oppression and soul-destroying nature of this system. Mandela visited the region. I understand from Hungarian diplomats at the time that he was a bit shocked. He was also impressed by the long history of countries like Poland and Hungary and their centuries-long struggles for freedom. The world had changed and Mandela was big enough to change with it. He also dug deep into the traditional African culture where a concept that deserves to be widely publicised exists. It is called Ubuntu. It means “humanity” or “humaneness”. Mandela, unlike his predecessor Luthuli, was no Christian, but instead used the ancient concept of humaneness. He was prepared to reconcile with his former enemies. He was prepared to put aside whatever personal feelings he may have had (and there must have been many) and consider the common good of all the people of South Africa. And so Nelson Mandela moved from being just another Communist/Third World Socialist revolutionary to being a statesman. After his election in 1994, he worked tirelessly to unite South Africans, and I would argue he succeeded. The most success I have seen is in the South African National Defence Force (SANDF). This is why I write so much about them, because there I see what South Africa could be and should be: a united nation, not caring about colour, working towards a common goal. Sadly, Nelson Mandela’s party, the ruling ANC, has left the path this man has trod. They have become complacent, rich and corrupt. But that is another story. So, what does all this add up to? Simple, really. Nelson Mandela tried, in his way, to free his people from Apartheid, which denied their human dignity and held them back from opportunity. I would admire him more had he turned to the traditional Western democratic tools and countries and I think he made a mistake backing Communism. He put money on the wrong horse, you could say. But when he emerged from his incarceration, he was already a statesman. South Africa, only united in 1910, has produced two, in my opinion. Field Marshall Jan Christian Smuts and now Nelson Mandela. I deeply respected Madiba and now that he has passed on, I can without qualms salute a decent man who, through reconciliation and vision, helped begin a new chapter in this country’s history. But he himself often said he was flawed. And he was, as I tried to show above. I will not build a shrine to the alleged saint. But I salute the statesman.